We have a Total Lunar Eclipse in Aquarius on July 27th at 4 degrees. This summer 2018 eclipse is a Full Moon ‘Blood Moon’ folks (when the moon goes red) so it’s sure to put on one big dramatic show! It’s got ‘Danger Danger, High Voltage’ written all over it, it’s rebellious, erratic, explosive and could make your blood run cold! The eclipsed Moon is conjunct Mars retrograde in Aquarius and square bent-on-change Uranus in Taurus so it’s sure to ruffle up some feathers. It also just so happens that this is Mars’ big retrograde moment - when it opposes the Sun in Leo - oops! Get ready for repressed feelings to erupt in a big way! How do you fare with anger management? Are you in touch with your sexuality? Do you honour your desires or do you sit there while resentment eats away at you? The world suddenly goes quiet, all the better for you to hear that little angry voice that you’ve been ignoring for so long. If you‘ve been going down the wrong path, this Blood Moon gives you some red hot reasons why you should pull back your forces right now and reconsider your attitude! What needs to change? Time to mount your very own revolution! The good news about this Blood Moon Total Lunar Eclipse in Aquarius is that it draws out the poison that’s been fouling your relationships, your thoughts, your community. Once the truth is out, you can finally begin to heal and take appropriate corrective action. This is a galvanising Lunar Eclipse. You’re reaching a major turning point in your life in an area where anger has been festering and change is long overdue! Time to do something about it. This Total Eclipse of the Moon signifies the culmination of something that began back in February 2018. How have you fared since then? What has come to fruition? What has failed to launch? Time to take stock. 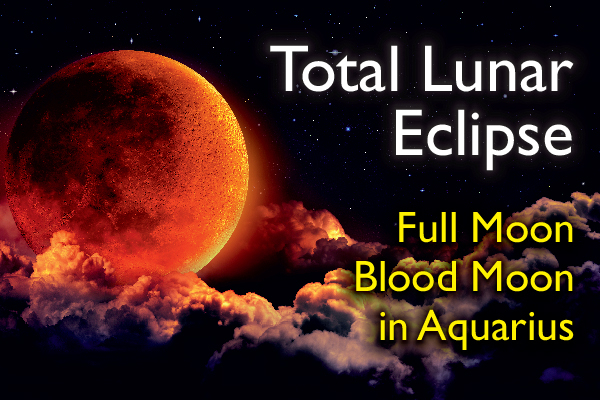 So how does this Full Moon Blood Moon Total Lunar Eclipse in Aquarius ring your bells? What comes to light for you? Where do you need to reconsider your attitude? Read on for your horoscope and the astrological prediction for your star sign! A friendship could implode over this Total Lunar Eclipse, dear Aries, and it could be over financial differences or a difference in values and priorities. If you are angry at your friend or if you and your people don’t see eye to eye, all the tension could come to a head now, signifying a major turning point in your friendship. This is no time to succumb to peer pressure. Honour your heart’s desires! Alternatively, it could also be deep resentment over an unfulfilled dream or unacknowledged ambition for a better life that erupts to the surface. It’s time to say good bye to destructive associations and ideals gone bad. Look to your own creativity and talents to make a difference in your world! You’re angry about where you are on your path in life, dear Taurus. This Blood Moon illuminates your unfulfilled ambitions and a sense that you have not honoured your desire to succeed and earn respect in the world. You might feel angry toward higher ups - a boss or a parent - and resentful of their wilful influence over you. Time to acknowledge that you want more out of life. Honour your desire to get to the top and be the one in charge of your destiny rather than letting others call the shots! A very unstable, rebellious streak is building up inside you and could erupt at any minute, especially against authority figures. Draw strength from within, your roots, your home and your soul’s true calling. You’ve got a blind spot in your personal philosophy, dear Gemini, and it’s built around some anger or resentment informing your beliefs. This sabotages your efforts to reach out and plays up in unpredictable ways, as will become clear at this Lunar Eclipse. You might feel resentful toward a VIP or people you’re involved with in an international, media or publishing project. Expect galvanising flashes of intuition and look to your dreams for insight. If you are angry about an unfulfilled desire to travel, study or bring yourself to a wider audience, then maybe it’s time to open communication channels about this? Talk about it, negotiate and work your network. Look to your immediate environment for an influx of ideas to help release unwanted thoughts. Whom can you trust, dear Cancer? You’re increasingly uncertain about where your loyalties lie and whether others will ultimately deliver on their promises. Friends are somewhat fickle at the moment. Does someone owe you money? Is someone power-playing you or messing you around, especially because you depend on them? Your ties, emotional and financial, are highlighted at this Blood Moon Lunar Eclipse, urging you to take back any power you’ve given away. An ally or acquaintance could surprise you, releasing repressed anger about you feeling powerless. It’s time to pay old debts. Look to your own talents and resources for strength and a boost to your self-worth. What do others bring into your life, dear Leo? What do you want out of your relationships? A partnership or business association could come to an end at this Blood Moon. If your love is strong, then it’s time to air your grievances, reconsider where you’re headed as a couple and make a fresh start. As the poison darts fly around, something clicks inside giving you the clarity to turn your whole life upside down and reconsider your career and relationship goals and your life direction. If you are single, it’s time to clear away past resentments that have been keeping you away from others. The sun shines on you ultimately. It’s your self-conception, looks and attitude that hold the key to change. Time to address a particularly nasty habit or work situation that's making you very angry, dear Virgo. What is that thing you do? Or the thing you don’t do but should, instead of running around serving others? Your lifestyle is grinding you down and if you’re increasingly feeling tired, run down or like a servant, something needs to change. A sudden health crisis could lead you to take some much needed corrective action. You need more freedom in your life and you might decide to run away at this eclipse - whether it is only to go on holiday or even to quit your job and fly to Timbuktu! Remember, you’ll take your bad daily habits with you wherever you go. The key lies in your own spiritual awakening and evolution. Take time to rest, meditate and alight on the answer. This is a seminal Blood Moon for your love life, dear Libra. It could signify the end of a love affair. Or it could suddenly see repressed sexual desires come to the surface or reveal a whole different side to your lover that comes as a shock. You could feel betrayed or that your sense of intimacy and trust are broken. Or you could feel liberated. This eclipse has the power to literally transform you, freeing you from emotional, sexual or financial bonds. A child could be acting up, causing you stress or it could be a creative project or financial speculation that reaches a climax point showing you what needs to change for you to get the returns you seek. Keep your friends, allies and likeminded folks around you to give you strength and clarity. A big change around your home and family is written in the stars, dear Scorpio! There is lots of anger and festering resentment within your household and it’s all coming to light at this Blood Moon. You finally see the extent of the anger you have toward a parent and any disruptive or rebellious influences operating from within your own soul. A spouse or partner could totally take you by surprise. Any confrontation at home is sure to drag out the past, but this is all the better to clear out festering poison. Look to your goals, your career and your place in the world for a key to your problems. What is your legacy? What support do you need to achieve it? If you’re involved in actual building works, you could reach a major milestone now. Hostility is erupting all around you, dear Sagittarius, so you’d better watch your step! Is it sibling rivalry? Is it unwanted sexual advances? Or maybe it’s bad blood with a neighbour or colleague? Paperwork and communications from work carry a poison sting and sudden changes at the office, or something a colleague says, could also surprise you. All this could awaken old angry thoughts. Time to have it out with someone! If your mind is stuck on a loop, you need a change of scenery, a holiday to clear your head. Or a lawyer… A trip abroad, a book, a seminar or a specialist who can help you with your problem could be the answer here, bringing you light and strength. Money matters reach critical mass on this Full Moon Total Eclipse, dear Capricorn. This could signify the end of a source of income or the final payment of a long overdue bill. It is time to reevaluate how you manage your resources, especially if you feel that your earnings don’t reflect your true value or that others are not giving you your money’s worth. It’s also time to reconsider what value you place on your talents, and on various things and people in your life. Old money resentments could come to light now, highlighted by debts, joint investments or financial backers coming forward. A child, lover or speculative project could trigger a financial crisis and a change of priorities. Things have been simmering away for a while, dear Aquarius, and all hell could now break loose! The trigger for this eruption could stem from old resentments and unfulfilled desires or from your home and family, a parent or flatmate, property you own or even your country of residence. A tremor in your foundations shakes you up, releasing a pressure valve somewhere in your head. Maybe it’s time to rethink your attitude? Maybe you need to redirect your energies in more constructive ways? Your habitual way of doing things seems to be getting you nowhere. Time for a change of strategy! This is a major moment of realisation that could change how you go about things. Look to others to shine a light on what needs to change. The Aquarius Blood Moon brings shocking communications and dark secrets to light, dear Pisces! It also brings spiritual revelations by uncovering repressed desires, anger and sexuality - in you or others - that you have been refusing to acknowledge. Trust your intuition and look to your dreams for clues. A chance encounter or something someone says could catch you by surprise and let you in on a secret. If you’ve been feeling low, watch out for psychosomatic symptoms now or for foul play behind the scenes. You might be totally blindsided by what occurs but once you’re in the know you can take appropriate action. You can rebuild your strength by focusing on your skills and on more wholesome habits to boost your work and health.